There are 4 basic operations. 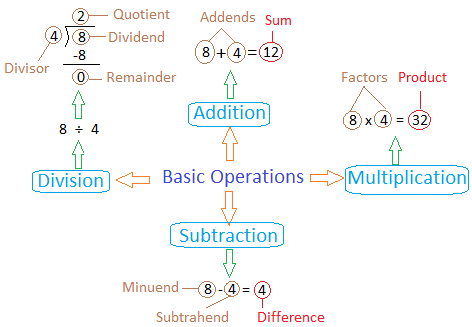 The graphic organizer below shows what these operations are along with some other important terms. Teachers! Use this graphic organizer to easily help your students understand this important math concept. Addends: the numbers being added. Sum: the answer to the addition problem. Minuend: the number you are subtracting from. Subtrahend: the number that is to be subtracted from the minuend. Difference : the answer to the subtraction problem. Factors: the numbers being multiplied. Product: the answer to the multiplication problem. Dividend: the number you need to divide. Divisor: the number you will use to divide. Quotient: the answer to the division problem. 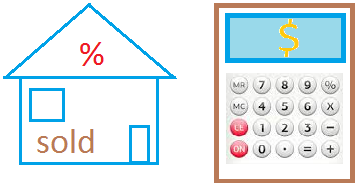 Remainder: a leftover when the dividend could not be divided evenly.